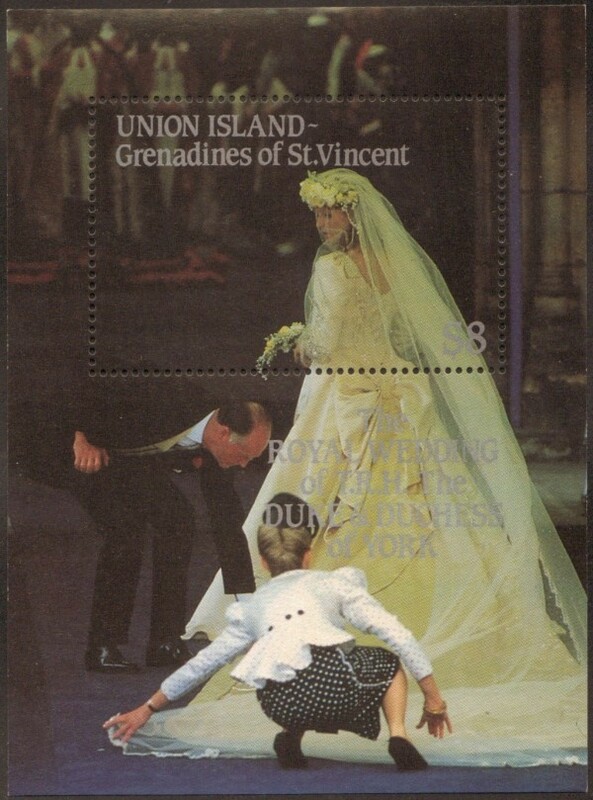 The 1986 Royal Wedding stamps issued for Saint Vincent Union Island have an interesting twist as the souvenir sheet for the set was never issued. My theorized reasoning behind this is that possibly the postal authorities rejected it on the grounds that the wedding dress appears to be a dark yellow in color in the image whereas in all other issues it is white as the dress was made in ivory silk. To the royal family this would be considered disrespectful. 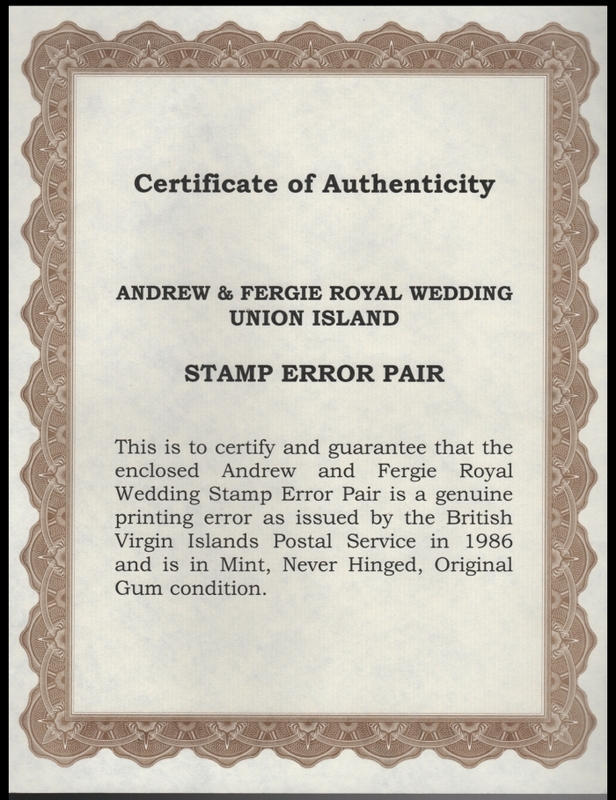 In any regards the country of Saint Vincent Union Island never issued the souvenir sheet to the public. So, what did the Format Printers do with this souvenir sheet which they had already produced along with all the issues for this series for eighteen contries? 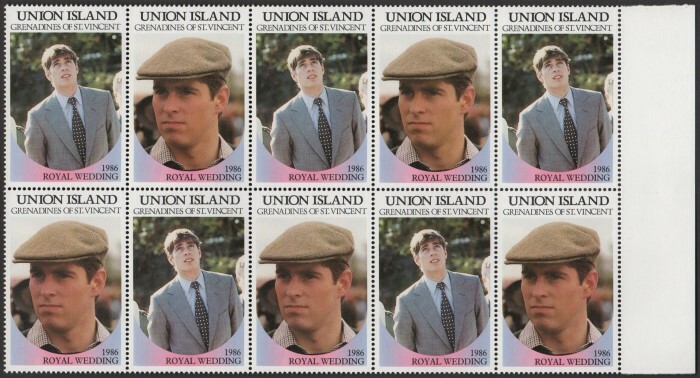 Of course, they saved them for resale as an unissued stamp to try to make some of the revenue back from printing them. You see, printing postage stamps is NOT free and printing a full run and then having it rejected and NOT paid for is not good business sense. In my opinion I do not blame them one bit. First I present the story about the tete-beches. It is an interesting story. With Union Island one cannot define the difference well by the inscriptions as they are similar with Tuvalu issues as in they are black. Prince Andrew's Cap is browner on the originals. This one is a bit difficult but again note the slightly darker toning. 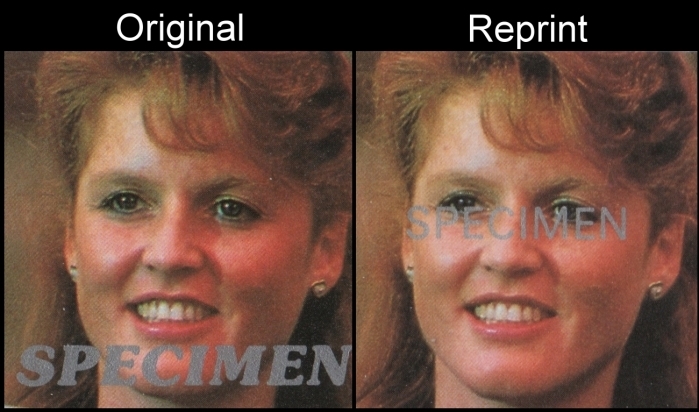 Complexion is a touch redder on the reprints. Note the much darker toning on the originals. The eye makeup much more intense! 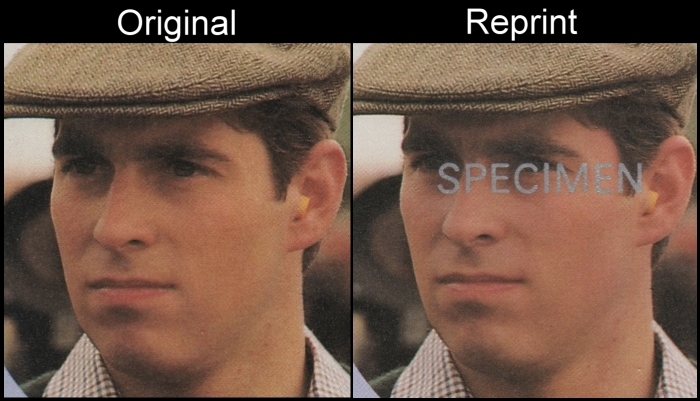 Note the deeper toning of the faces on the originals. A deeper bluish hue on Prince Andrews collar on the originals. At present I have only 3 uncut press sheets of the 60c value still intact. At present I have 3 uncut press sheets of the $2 value still intact. 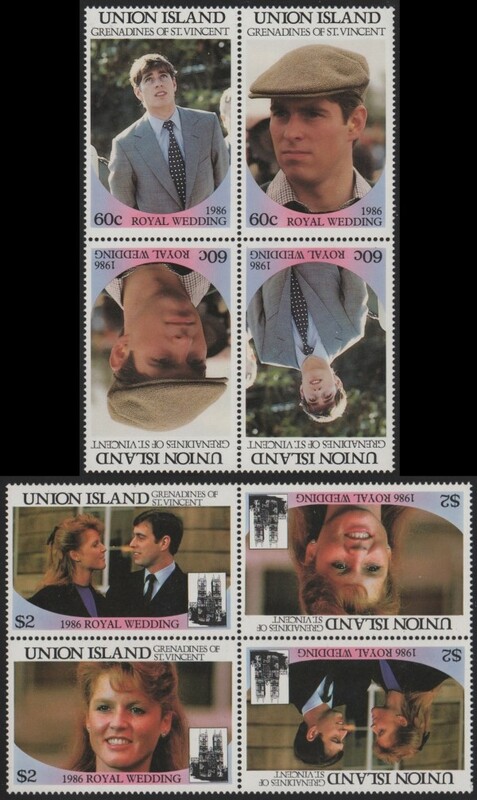 These were found in the Bileski Estate holdings. Basing on 150 sheets being produced of each value we can calculate that 5 x 150 = 750 of these gutter pairs could exist. The same number of tete-beche blocks could exist. In my acquisitions of the Bileski estate I have managed to reunite a major portion of the tete-beches he created of the 1st issue. For some countries almost 100%! With Union Island I have recovered around 50% of the Bileski stock. Referencing from the Robson Lowe count of sheets found in the archive and the additional sheets recovered from the police evidence stock I can assure you that the tete-beches and gutters are pretty rare! Approximately 100 tete-beche gutter blocks and 100 straight-up gutter blocks of both values probably exist. Tete-beche blocks are available in various locations at very low pricing showing that quite a few must have been retained. Tete-beche pairs are possibly more common although I do not see much being offered. As far as large selvage stamps go, 10 pairs can exist from each sheet, 5 from each side, thus 750 pairs. Not a lot with the millions of collectors out there. Because of the formation of booklets only corners are the sure way of proof that they came from the press sheets. Only around 50-60 of each value probably exist now. Then divide that by 4 for the different corners. You see my point? Rare! 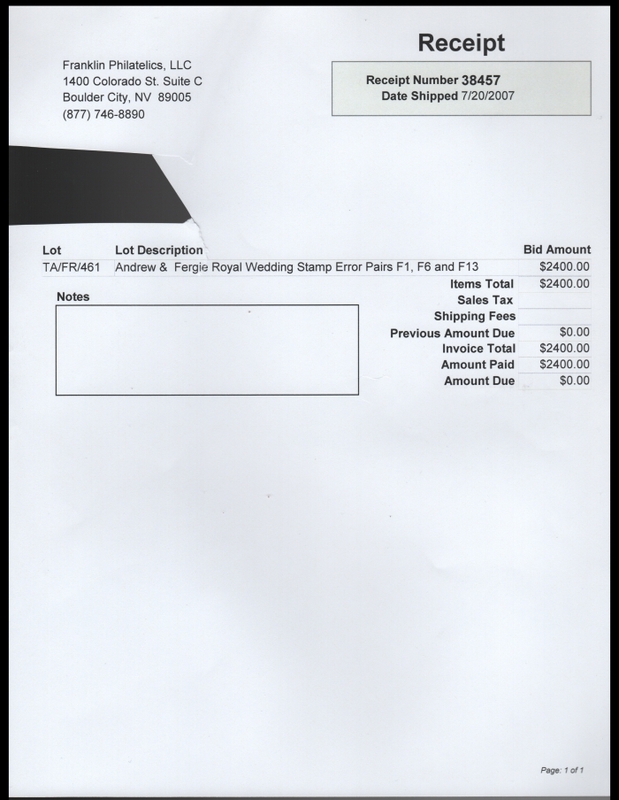 Pricing should run $25-35.00 for intact gutter pairs either tete-beche or not unless a huge cache is found which is doubtful. Tete-beche pairs $5.00 and blocks at $10.00! They are rare but not exceptionally so. Stamp pairs or singles with the LARGE corner selvage should run at $10-15.00 each! The above imaged format exist for the SPECIMEN overprinted stamps as well. 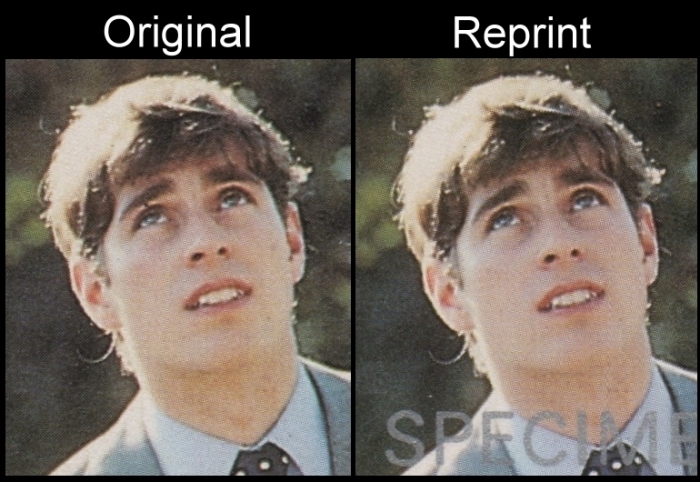 There are two versions of the SPECIMEN overprint. The first being larger letters in italic in silver and the second being smaller block capital lettered in silver. 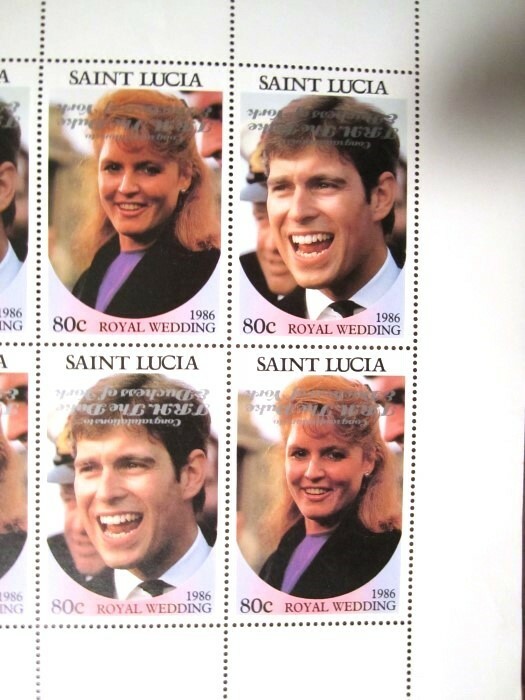 Both types exist on the Union Island royal wedding stamps. 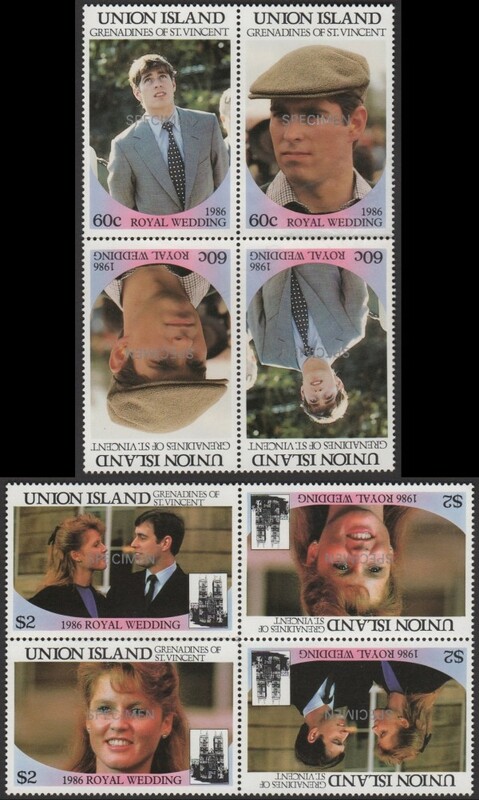 No evidence on the large specimen overprinted stamps has been released. Sale of them has begun on eBay from the Saint Vincent side of the police evidence stock thus showing a number of them still exist. It looks like the owner of the stock is breaking the sheets for some of them. It has been documented that 5 intact perforated uncut sheets with the smaller SPECIMEN overprint existed quite a few years ago. This was from the archive and documented on the Bileski/Robson Lowe end. They were all broken into gutters and tete-beche blocks and pairs. I now have found that much more exists. A different seller on eBay has been releasing them in large blocks. The smaller overprint is from the second printing. It was documented to me a few years ago that 28 perforated $2 uncut press sheets with the small specimen overprint still existed. 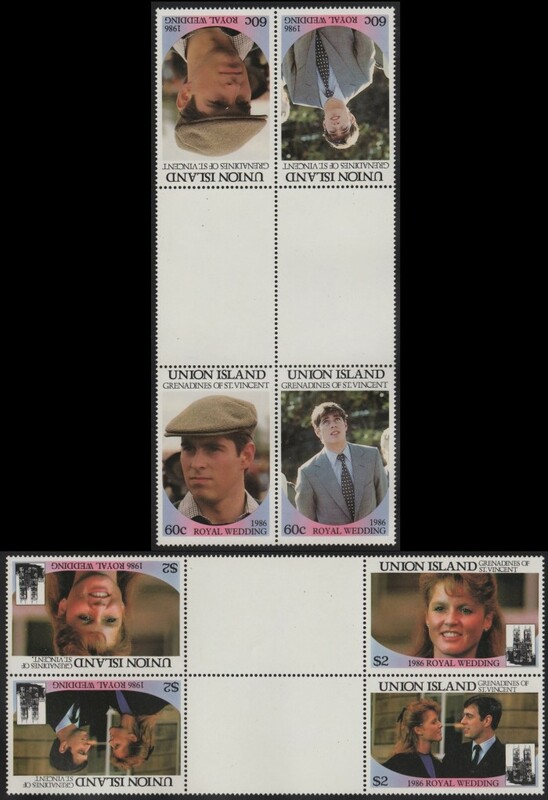 I suspect that the 60c values being sold on eBay in large blocks now are the other half and thus same quantities of the sheets existed. 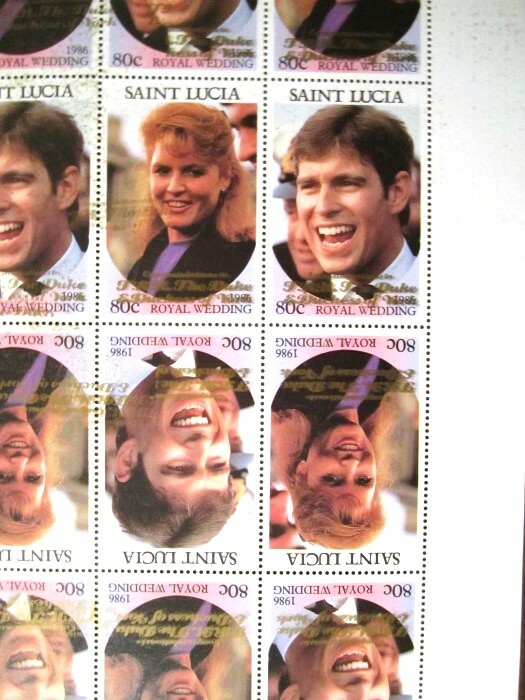 Based on equations from the Saint Lucia side of the police evidence stock and practices of the printer, it is estimated that 50 sheets of the large overprint were made thus producing 2000 sets whereas 75 sheets were made with the smaller overprint thus producing 3000 sets. Here we must then calculate that for the perforated large and small specimen overprinted stamps. They are not rarer than the normal perforated gutter pairs above. At present though the tete-beche blocks and pairs are rarer than normals. They are being sold as intact gutters and tete-beches. Therefore pricing should be based more on the Saint Lucia equations. Therefore for the perforated SMALL specimen overprinted at least $15-20.00 for intact gutter pairs either tete-beche or not. The larger overprinted gutter pairs, tete-beches etc. should command a 25% premium on top of that. 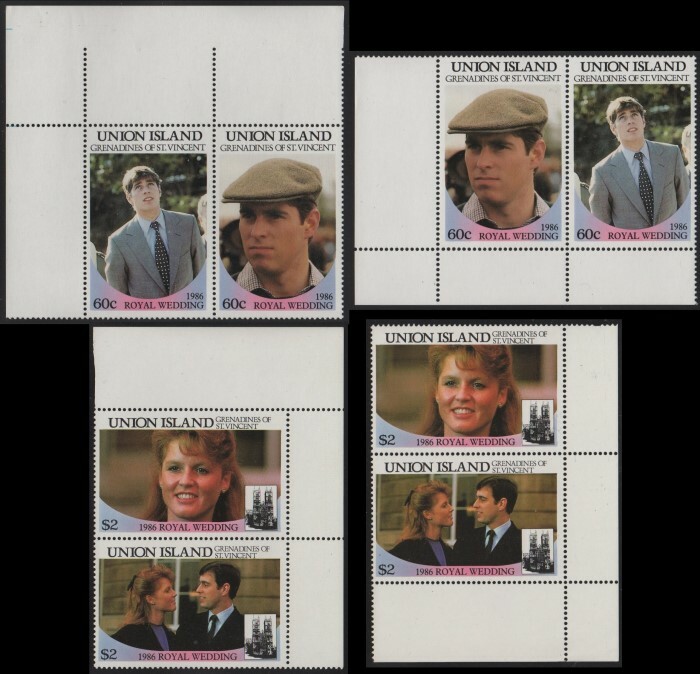 Again intact uncut press sheets are fast becoming into the extremely rare category now. The 2nd issue had both silver and gold overprints. The gold overprinted stamps were never issued postally. It has been documented that 10 uncut press sheets of the 60c value with Silver overprint still existed a few years ago. It has been documented that 64 uncut press sheets of the $2 value with silver overprint still existed a few years ago. It has been documented that 26 uncut press sheets of the $2 value with Gold overprint still existed a few years ago. There is no documentation on the 60c value with gold overprint but pieces have been sold on eBay as the image shows. I would like to note that because of the way the sheets are being broken the rarity factor for tete-beches is increasing as I write this. Research shows that we can safely presume 150 sheets of the Silver overprinted were printed of each value thus producing 6,000 sets of pairs. Here we must then calculate the pricing for the SILVER overprinted stamps a bit lower than the small specimen overprinted perforated gutter pairs etc. above. Since there are the same numbers printed as the LARGE specimen overprinted stamps above we must then price the GOLD overprinted stamps at the same values. Because evidence is pointing to similar errors existing for Saint Vincent Union Island, I am presenting this section from the Saint Lucia page on these type of errors. At present none of these errors for Union Island are on the market but with the pieces I have received from other sources I suspect that the same holds true for Union Island issues. As I stated earlier so far I have not seen any of these errors for Union Island. If you should see or have them please contact me with details. A bit of bad news for sellers over inflating prices. It has been documented that 45 uncut press sheets of the $2 value with Missing Value still existed a couple years ago. There is no documentation on the 60c value with Missing Value but pieces have been sold on eBay as the image shows. Evidence shows that 100 sheets were produced making 4000 sets possible. Thus the same rules should apply as the small specimen overprinted stamps above as far as value. Based on these numbers and other research one should value these at around $5.00 a pair. Gutter pairs and blocks and selvage pairs should be priced close to the same (or a little less) than the perforated small specimen overprinted stamps above. 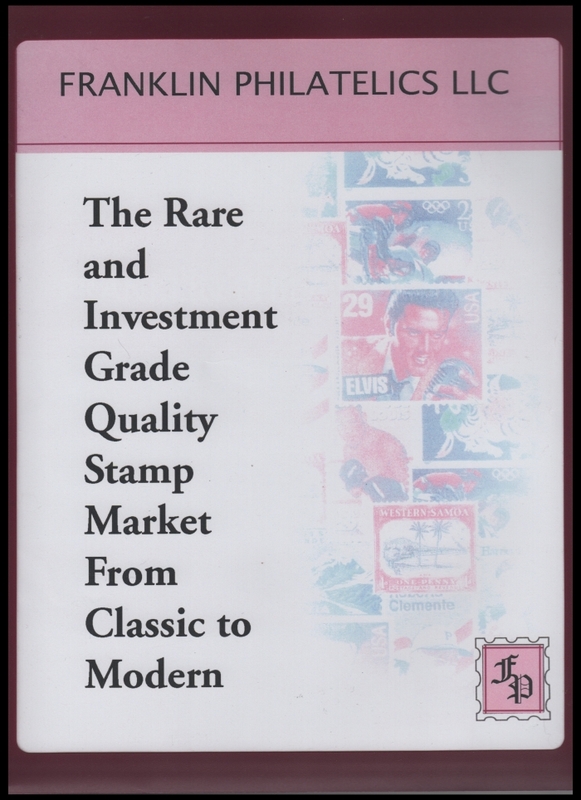 I just purchased on eBay a selection of "investment" stamps sold by Franklin Philatelics LLC. These were sold in 2004 and 2007 when they were located in Florida and Nevada. These criminals ripped off the investor for over $11,000! 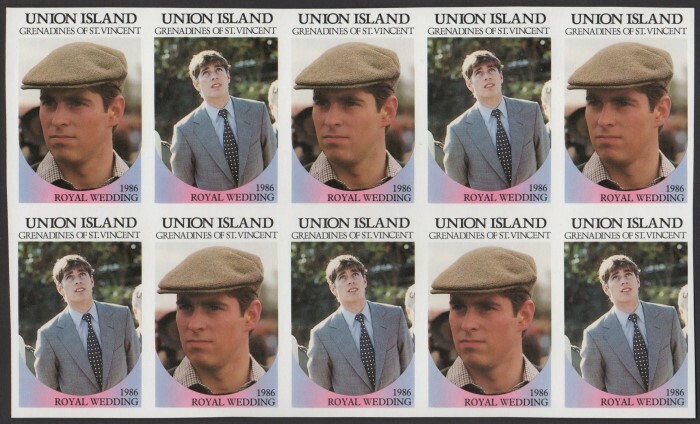 In this "collection" was the $2 Saint Vincent Union Island missing value error. Because I have found it documented that 45 press sheets exist, I suspect that these criminals possibly possessed all the rest that exist. In a recent search I could not find anyone selling either error. As I stated before, the research shows that probably 4,000 exist and therefore they are worth at most $5.00 for a pair. 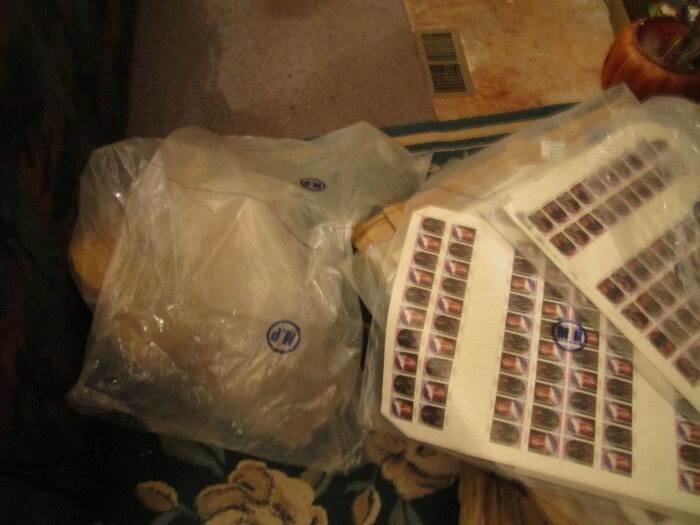 Here are images of the Franklin Philatelics receipts, stamps and certificates. The certificates are bogus computer generated garbage and nothing they sell was ever "issued" as the certificates imply. Never buy anything from anyone that wants to give you certificates like these. 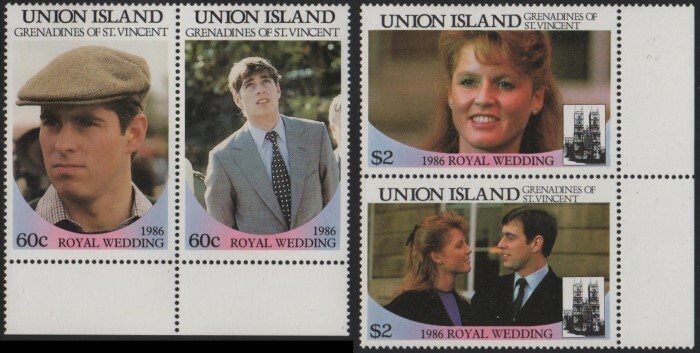 Saint Vincent Union Island 1986 Royal Wedding Missing Value Errors that were sold by Franklin Philatelics LLC for $800.00! This was number F13. See Montserrat and British Virgin Islands for the other lots listed in the receipt. So far there exists imperforate proofs including finals and imperforate SPECIMEN overprinted sheets. Also imperforate missing value errors. This totally disputes the statement in Stanley Gibbons that imperforates come from booklets. 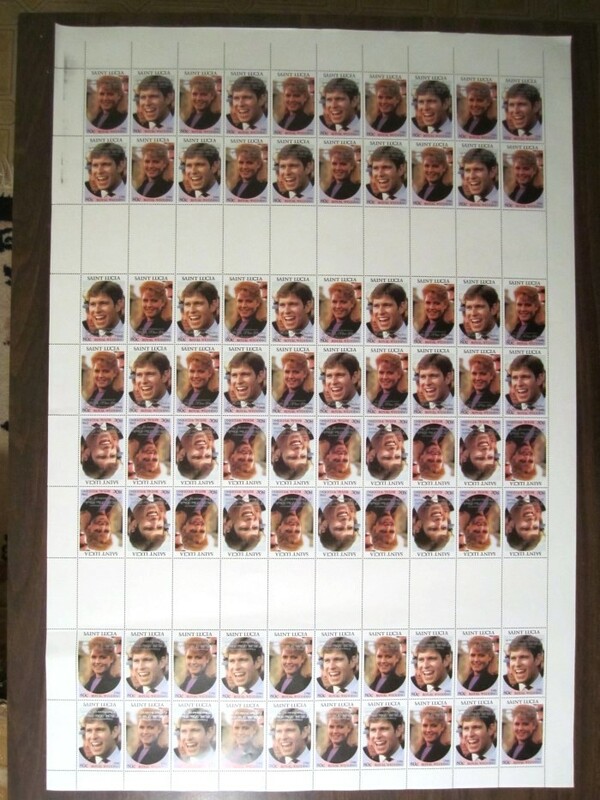 It has been documented that 58 uncut press sheets of the imperforate $2 value still existed a couple years ago. There is the possibility that they are all that is left from the progressive color proof sets. There is nothing documented on the 60c value. None other than booklet panes and pairs probably from booklet panes are on the market. Possibly they will turn up with the selling of the Saint Vincent side of the police evidence. Evidence shows that 75 sheets were produced making 3000 sets possible. Another 75 sheets would be included with the progressives. Thus we can see that these are in the same class as the perforated small specimen overprinted stamps above unless more are found. Based on these numbers and other research one should value these the same as the above mentioned specimen overprinted stamps. 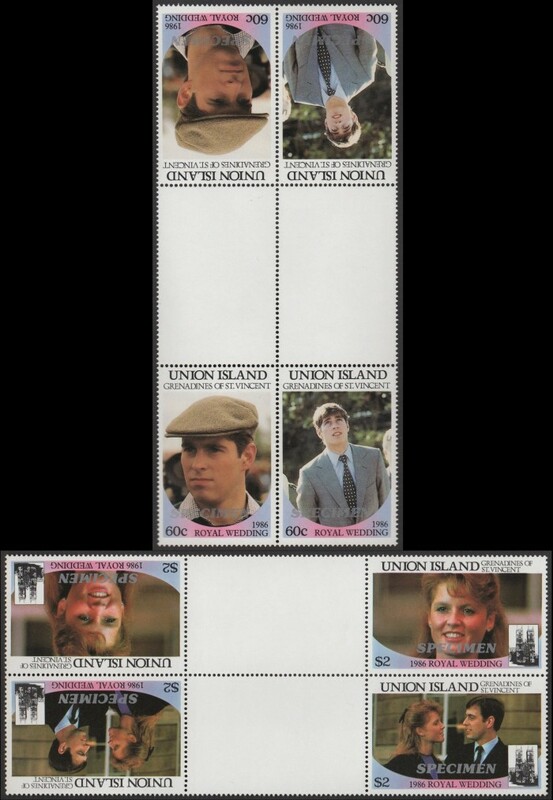 WARNING: please be very careful in purchasing these imperforates as previously shown most come from booklets and are not actual proofs and thus do not have the value of the actual proofs. At present it seems that only imperforates with the small block capital lettered overprint exist. It has been documented that 28 uncut press sheets of the imperforate $2 value with SPECIMEN Overprint still existed a couple years ago. There is nothing documented on the 60c value. Based on these numbers Gutter pairs and blocks and selvage pairs should be priced at the same pricing of perforated GOLD overprinted stamps shown above. It has been documented that 10 uncut press sheets of the imperforate $2 value with Missing Value still existed a couple years ago. Based on these numbers Gutter pairs and blocks and selvage pairs should be priced the same as imperforate specimen overprinted imperforates above. Possibly all were destroyed? Possibly still in the Police Evidence waiting to be discovered? Time will tell. 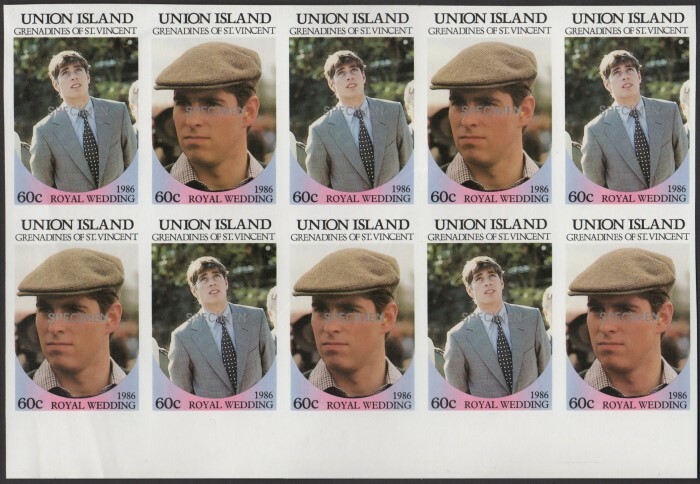 This basically sums up the stamp varieties for the Union Island 1986 Royal Wedding single stamp issues printed by the Format International Printers Ltd. 3. )One dealer of Format Material (mentioning no names) is selling bulk lots of 5 seeming to have many copies. Another 1,500 were produced with the progressive color proofs. We have acquired all but a few via the police evidence. The count is 2,430 of which a few were damaged. In accordance pricing should be around $10.00 each. At present there seem not to be hardly any of the progressive color proofs left. In our receipt of these only a couple colors were in the shipment and of those only about 30 of each except for one pack of final colors without inscriptions. Possibly the 9th which is missing in most progressive proof sets. We believe most may have been destroyed. Still searching. If this is the case then the finals from the progressive side will also be sold alone with the final color ones without inscriptions. We found none in the the police evidence. None appear to be on the market. Destroyed? In accordance pricing should be around $20-25.00 each considering rarity if they are found to exist. We have acquired only the above mentioned via the police evidence. It is possible almost all are lost forever. We have noticed that the final color progressives for other country souvenir sheets are sometimes being sold as an error as it does not have the silver inscriptions. This is not correct. It would only be an error if it was perforated. At this time there is no evidence that any made for collector errors were made for this particular souvenir sheet. 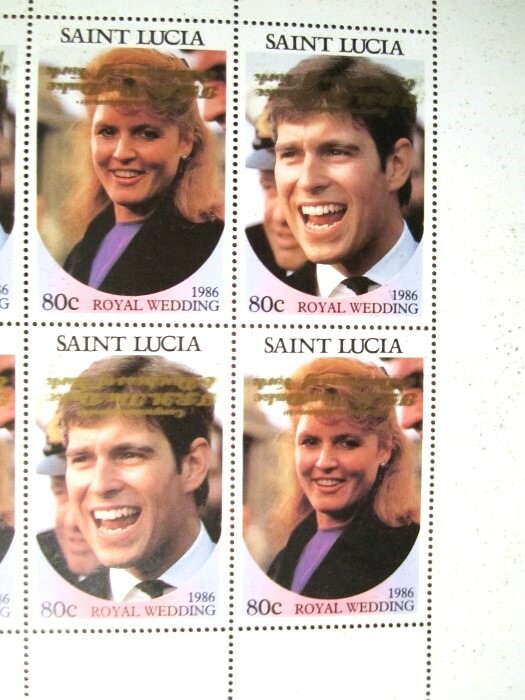 This basically sums up the stamp varieties for the Saint Vincent Grenadines Union Island 1986 Royal Wedding unissued souvenir sheet. As new information and evidence is found it will be added to this page.